Happy as a Pig in Mud Cake!!! Fondant icing for the pigs, any kind of cake in 2-9 in round cake pans, icing around cake to hold KitKats in place. Top the cake with melted chocolate icing then place your fondant pigs in the melted icing!!!! Perfect for a Farm themed party!!!! #Beyond Cute. Today is my granddaughter's 11th Birthday today!! Birthday wishes to you Bella! I have included this cake and instructions so the one that is in charge of my birthday cake now knows what I want this year. It is so cute. We stayed home and set up the outside stuff for our home site. We went to Giovanni's Restaurant for dinner. I love that place and will miss it when we leave Florida. We then went to Wal Mart and did a bit of shopping for food stuff. The park is full in the full hook-up section. There are many sites open down here where we are. Our daughter told us about this neat app. It is call 4 pics 1 word. I am now officially addicted. It is fun peeps. I found the next item on the news on line and thought it was interesting and quite inventive and eye catching for a job application. I included it for those of you that my find themselves in the position of having to look for a job. This could be added to the must use applications. For any job searcher, there is nothing quite as sweet as landing a job in a tough economy. For one specific job searcher, Nick Begley, of New York, the sweetness was in how he landed the job. 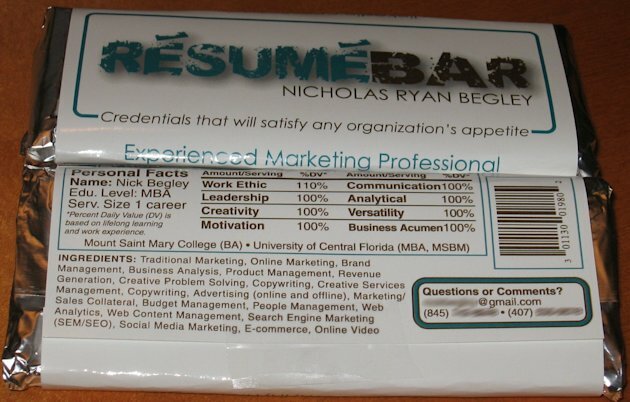 Begley, 32, used the label of a candy bar to sell himself to potential employers, crafting his resume onto a "Resume Bar." Using the tagline, "Credentials that will satisfy any organization's appetite," Begley sold himself on the bar as an "experienced marketing professional" with a serving size of "1 career." Instead of calories the bar listed his education level, MBA, and instead of vitamin counts, the bar's label touted Begley's 110% work ethic, 100% communication and 100% versatility, among others. Begley created 12 of the bars after he completed his MBA at the University of Central Florida in 2009 and was searching for jobs in New York. His unique take on the job search got a second life this week when his friend, Eli Langer, posted a photo of the bar on Reddit, where it has received more than 3,000 comments. "People are either going to love or hate it," Begley told ABCNews.com today. "My focus was to find an organization that would embrace it because if they weren't open to that kind of out-of-the-box thinking, that wouldn't be a company that I would fit in well with anyways." Begley had already found an organization, the Orlando Magic basketball franchise, that embraced his creativity while in graduate school. The team hired him for a summer internship after receiving a "ResumeBar," which gave Begley all the confidence he needed to try it again. The sweet approach worked a second time in 2009 as Begley landed a marketing job less than three months after he began his job search, with LeagueApps, a platform that connects adult recreational athletes. Begley, who also once had his resume delivered along with a pizza, says his brother, Jeremy, designed the label for him and he had it printed at Kinko's. He put the label atop a standard Nestle Crunch bar, making his resume not-so-ordinary for less than $2.50 per bar, he estimates. "Of course," Begley said when asked if it was worth it. "It was creative and put me ahead [with potential employers] as far as understanding that I was willing to go the extra mile." Simple theme. Theme images by michieldb. Powered by Blogger.